Trade globalization and advancement in ICT may be considered as the two major forces that will be directing economic growth of a country in the coming years. Policy makers have realized the importance of ICT in achieving national goals in the digital era. 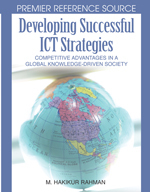 The developing and underdeveloped countries generally lack research capacity and standard policy development processes that are critical for developing a successful ICT policy. Cause of policy failure in these countries can most of the time, be traced to flaws in policy development process rather than environmental complexity. The chapter provides an insight on policy development process from strategic management perspective to highlight critical issues, which are sometimes overlooked by policy makers. The purpose is to assist the policy makers in developing successful ICT Policy for their countries.